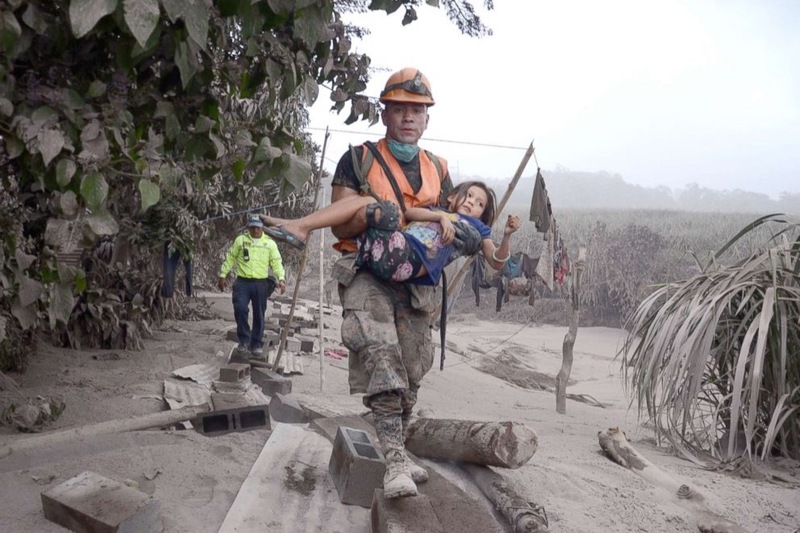 Fuego Volcano erupted on June the 3rd in Guatemala, leaving a toll of at least 69 fatalities, 300 wounded and 4000 evacuated so far. The number of missing people is still unknown and it is calculated the catastrophe will affect at least 1.7 million people. One of the most affected villages was El Rodeo, located very close to the volcano. People lost everything after the village was completely buried by the lava. These people come mostly from a poverty background and need help rebuilding their lives. My name is Daniela Yurrita, I am a guatemalan living abroad and I want to help my fellow citizens regain hope. The point of this fundraising is gathering money from the people who, like me are living outside of the country and want to help. The money will go to the Rotary Club in Guatemala (Club Rotario Guatemala del Sur), a non governmental organization which is making sure that every donation is used for the right purpose and reaches the right people. The plan is to use the funds after the crisis has passed and have a long lasting impact in the lives of the survivors by rebuilding the village and reintegrating people. One of the main focuses of the funds will be the schools. 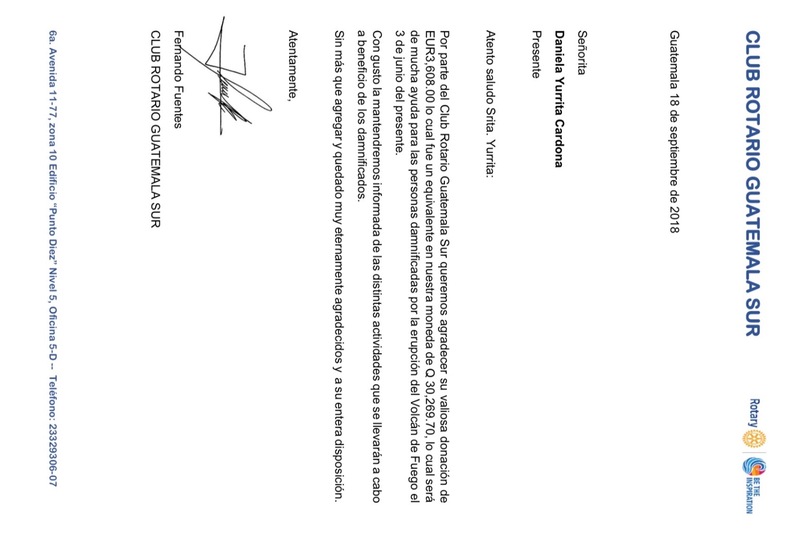 Proof of the transfering of the funds will be posted. As well as a report, following up the rebuilding project. Der Vulkan Fuego brach am 3. Juni in Guatemala aus und forderte bisher mindestens 69 Todesopfer, 300 Verletzte und 4000 Evakuierte. Die Anzahl der vermissten Personen ist noch unbekannt und es wird berechnet, dass die Katastrophe mindestens 1,7 Millionen Menschen betreffen wird. Eines der am stärksten betroffenen Dörfer war El Rodeo, ganz in der Nähe des Vulkans. Die Menschen haben alles verloren, nachdem das Dorf vollständig von der Lava begraben wurde. Diese Menschen kommen meist aus einem Armutshintergrund und brauchen Hilfe beim Wiederaufbau ihres Lebens. Mein Name ist Daniela Yurrita, ich bin ein Guatemalteke, der im Ausland lebt und ich möchte meinen Mitbürgern helfen, die Hoffnung wiederzuerlangen. Der Sinn dieser Spendenaktion besteht darin, Geld von den Menschen zu sammeln, die wie ich außerhalb des Landes leben und helfen wollen. 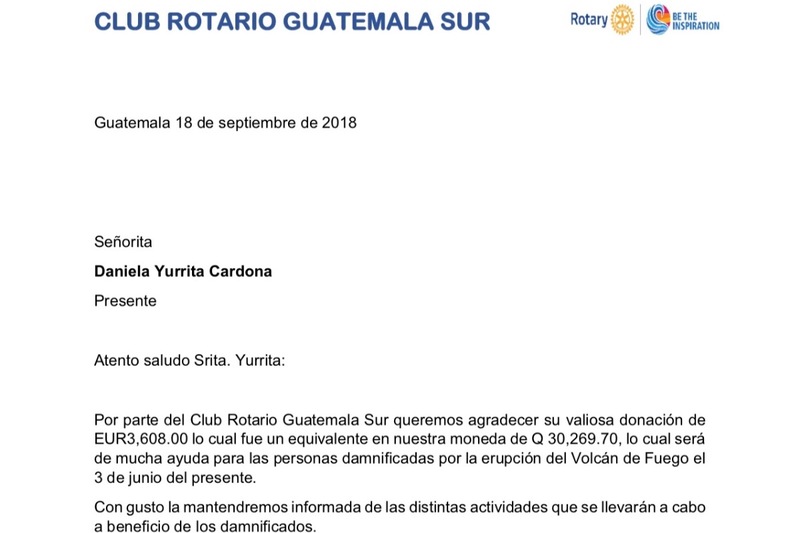 Das Geld geht an den Rotary Club Guatemala (Club Rotario Guatemala del Sur), eine Nichtregierungsorganisation, die dafür sorgt, dass jede Spende für den richtigen Zweck verwendet wird und die richtigen Leute erreicht. Der Plan sieht vor, die Gelder nach dem Ende der Krise zu verwenden und durch den Wiederaufbau des Dorfes einen nachhaltigen Einfluss auf das Leben der Überlebenden auszuüben. Ein Schwerpunkt der Fonds wird der Dorfschulen sein. Der Nachweis der Überweisung der Mittel wird gebucht. Sowie ein Bericht, der das Wiederaufbauprojekt verfolgt. A big, big thank you to all of the people who supported this campaign. Rotary has informed us that they are already starting the construction of three schools, with full technology labs which means an improvement on the schools that were tore down with the catastrophe. These schools will serve as a model for other rural communities. They hope to keep developing this project and reach as many people as possible. For your valuable contribution to this cause thank you very much!!! P.S. I'm attaching the thank you letter from Rotary, it's directed to me, but it really goes to all of you out there who believed in this project! Dear everyone, thank you so much for your trust in this campaign! Thanks to your generosity, we have reached the amount of 3,730€. That after Gofundme's processing fees are 3,607.78€ that will truly make a difference in the lives of people who are still suffering the consequences of this terrible tragedy. I have already withdrawn the funds and will be transferring them this week to the Rotary foundation's account. I'll be posting proof of the transfer when it's finished, so all of you who made this possible know your help will be now finally reaching those in need.